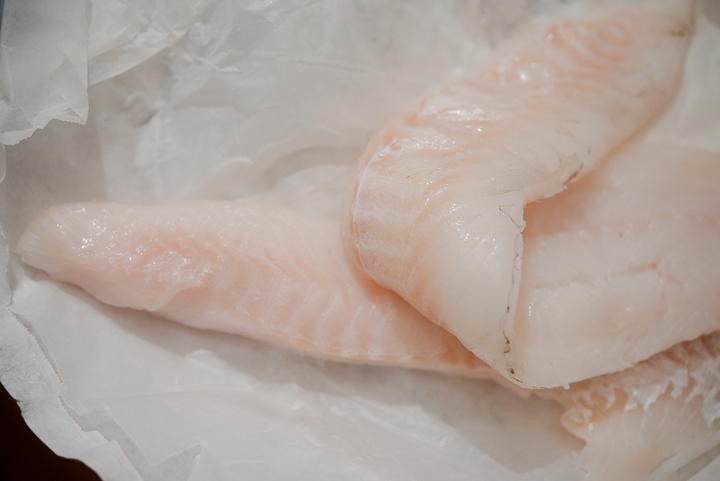 Every Monday, we pick up a pristine package of filleted fish at Rosemont Market on Munjoy Hill. 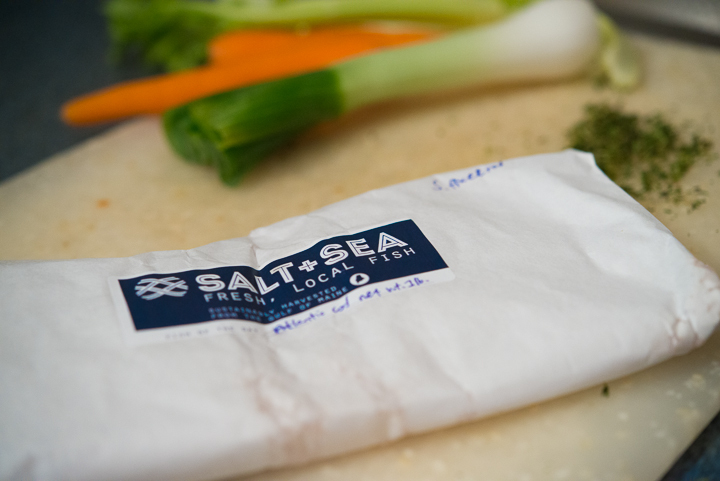 One of the bright spots for us this Spring-that-isn’t is our weekly package of super-fresh fish from Salt + Sea, the Portland-based fish and seafood “CSA.” Full-disclosure: I had heard about Salt + Sea, but didn’t get around to joining until my colleague Heather Steeves mentioned there was a Groupon — 4 weeks of a single share (1 lb of fish a week) for $21. This was a huge bargain, but Ted and I have liked it so much we are signing up for the usual 8 weeks at the still-reasonable price of $96 for a single share. For those of you who are as math-challenged as I am, that translates to $12/week — to feed two people well and have leftovers for one lunch. Like most CSAs, Salt + Sea works on the you-take-what-you-get model, with the harvest from the Gulf of Maine and Georges Bank instead of the farm. They work with several fishermen, “local harvesters who use responsible practices and who target sustainable stocks,” according to the website, and offer two-options: fish and seafood, which go from boat to you in no more than 24 hours. The first week, the catch was redfish. Our package held beautifully filleted, skin-on pieces, which Ted lightly beer battered and deep fried in the wok, making a spicy, Chinese-style dipping sauce to serve on the side. Fabulous. 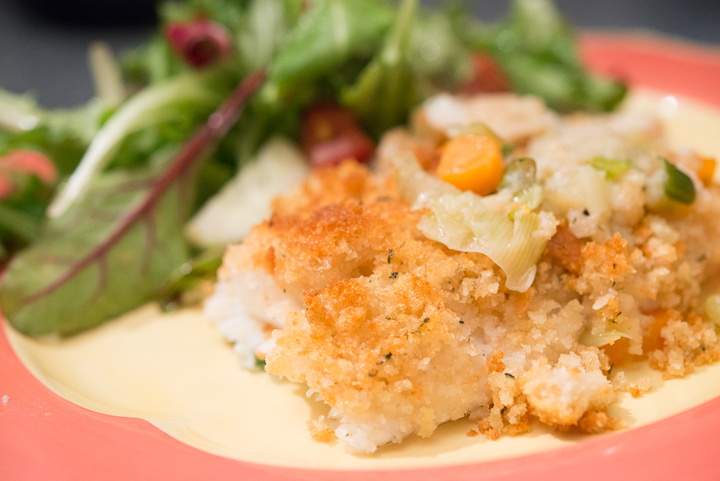 The following week, we received hake, which I prepared in a vaguely French way: placing the fish on a bed of wilted leeks, carrots and celery, topping it with buttered breadcrumbs and pouring a little white wine in the bottom of the dish. I baked it for about 10 minutes, then crisped the crumbs under the broiler. It seemed like something Julia Child would do, which made me happy. And it was also fabulous. We don’t normally offer cod because as many of you know the Gulf of Maine cod stocks have been decimated. The Harmony caught some cod on Western George’s Bank, which is a really healthy stock. We wanted to offer it today for those of you who love cod, but are nervous eating it because of the ecosystem. Looking to repeat the previous week’s fabulous-ness, I used the same method with the cod. This time, however, I had some dried out French bread from Rosemont Market, which made much toothier and tastier breadcrumbs than the dried stuff from the can — all I had on hand for the hake. Grinding the stale bread in the food processor made a huge racket, sending the dogs running for cover. But the crumbs were exactly what I wanted: lightly browned and crunchy on top, softer next to the fish. The cod itself was astonishingly delicious, most likely the best piece of fish I can remember eating. This recipe will work beautifully with any mild, flaky fish. Note that seasoning is super-important; do not skimp with the salt and pepper. Good-quality butter makes a big difference too. Butter the bottom of a glass or ceramic pan large enough to hold the fish in a single layer (I used at 9 x 13 pan). Melt 2 tablespoons of the butter in a medium skillet. Add the carrot, leek and celery, saute until just tender. Season with salt and pepper. Transfer the vegetables to the pan, spreading in an even layer in the center. Lay the fish on top and sprinkle it with salt and pepper. In the same saute pan, melt 2-3 more tablespoons butter. In a bowl, combine the breadcrumbs, thyme and a sprinkling of salt and pepper. Pour the melted butter over the crumbs and mix to blend. (If the crumbs seem too dry – they should be buttery but not oozing – melt and add more butter. Distribute the crumbs evenly over the fish, pressing down lightly. Don’t worry if some of the crumbs fall off. 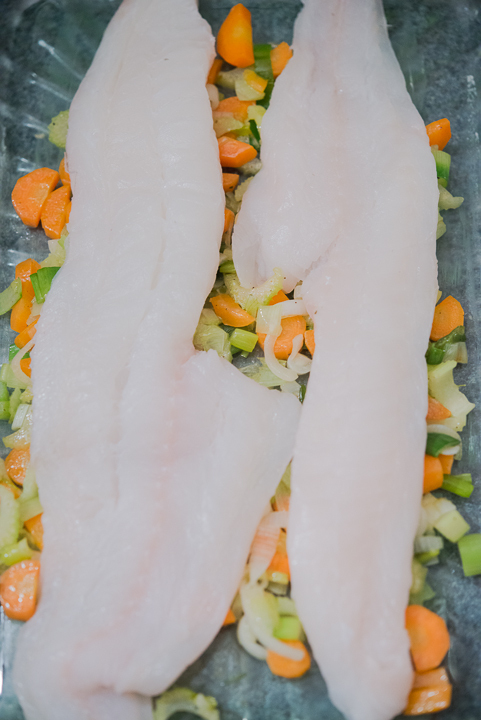 Pour the white wine around the fish and bake for 10 minutes, or until fish flakes with a fork (do not over bake it, it will cook further in the broiler). Place the pan under the broiler for 2-3 minutes or until crumbs are lightly browned. 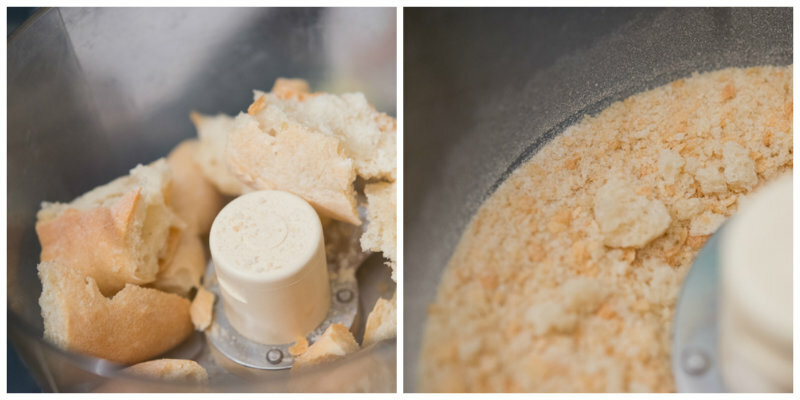 Fresh breadcrumbs made by pulsing stale French bread in the food processor. They don’t have to be all the same size. The cod nestled onto its bed of vegetables. 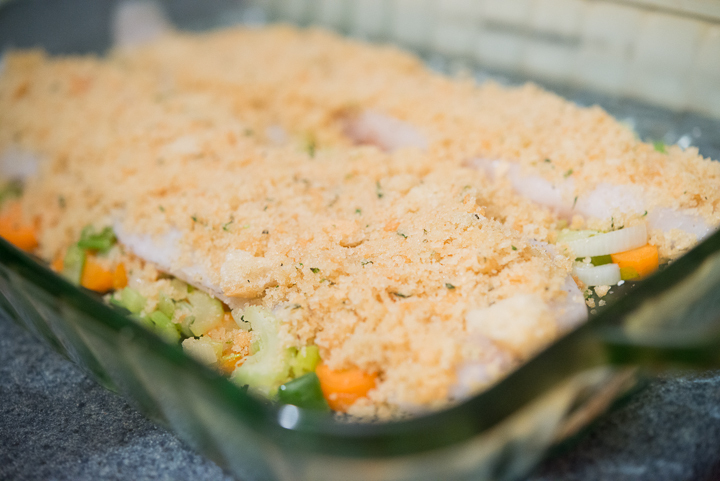 The crumb-topped fish ready to go in the oven. For more on Salt + Sea, see Meredith Goad’s story about fish CSAs in the Portland Press Herald.